Two first half goals proved enough for Bowdon Hightown to battle past Leicester and leap-frog them in the Investec Women’s Hockey League Premier Division on Saturday. Leaders Swansea dropped their first points of the season as they drew with hosts Olton and West Warwickshire 1-1 on Saturday. Jo Westwood put Swansea ahead with a 15th minute strike from open play, but Mandy Gatherer levelled for Olton after 20 minutes of the second half, and they held on to secure a point. Gloucester City moved up to third in the table after securing a 5-3 win at Isca university. Zoe Burford was in fine form for the visitors with four goals, while Kim Pullon scored Gloucester’s other. 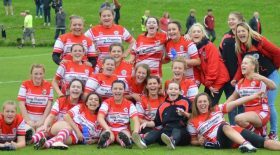 Megan Crowson scored twice and Sophie Jefferson added another, but it wasn’t enough for Isca. Elsewhere, Bristol Firebrands won 4-3 at Trojans, while Oxford Hawks were 4-2 winners at home against the University of Bristol. In the day’s late match, Sutton Coldfield won 1-0 at Stourport. Two goals from Amy Sheehan helped Slough secure a 4-0 win at Ipswich and remain unbeaten in the Investec Conference East. Alex Scott and Laura Bailey were also on target in the victory, which leaves Slough with a 100 per cent record. Second-placed Cambridge City were forced to settle for a point from a goalless draw with third-placed St Albans, while Wimbledon were 3-2 winners at Hampstead and Westminster. Maidenhead and Chelmsford drew 2-2, as did Harleston Magpies and Sevenoaks. Wakefield remain top of the Investec Conference North after Rosie Tootell’s late goal rescued a point in a 2-2 draw at home to Ben Rhydding. Tanisha Janzen put the visitors ahead early on before Georgia Byas struck back for the leaders, and Beth Cordukes looked to have won it for Ben Rhydding until Tootell’s late intervention. That result allowed second-place Loughborough to gain ground with a 2-1 win at home to Whitley Bay and Tynemouth after trailing at half time, whilst the University of Durham moved up to third with a 2-0 win at Springfields who stay bottom. Elsewhere Brooklands Poynton won 3-1 at Liverpool Sefton and Belper were 2-1 winners at home against Beeston. 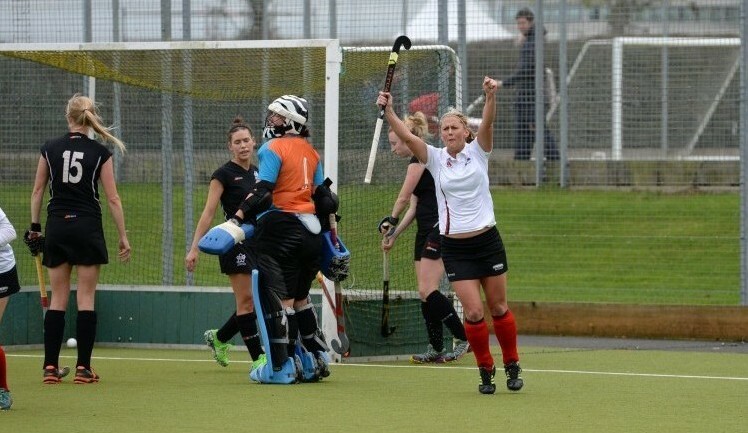 * The above photo shows Bowdon Hightown’s Lisa Garbutt celebrating a goal against Leicester. Investec Premier Division: Clifton 2, Buckingham 1; Holcombe 2, East Grinstead 1; Leicester 0, Bowdon 2; Surbiton 7, Reading 0; University of Birmingham 1, Canterbury 1. Investec Conference East: Cambridge City 0, St. Albans 0; Harleston Magpies 2, Sevenoaks 2; Ipswich 0, Slough 4; Maidenhead 2, Chelmsford 2; Wimbledon 3, Hampstead and Westminster 2. Investec Conference North: Belper 2, Beeston 1; Liverpool Sefton 1, Brooklands Poynton 3; Loughborough Students 2, Whitley Bay and Tynemouth 1; Springfields 0, University of Durham 2; Wakefield 2, Ben Rhydding 2. Investec Conference West: Isca 3, Gloucester City 5; Olton & West Warwicks 1, Swansea City 1; Oxford Hawks 4, University of Bristol 2; Stourport 0, Sutton Coldfield 1; Trojans 3, Bristol Firebrands 4. Tickets are available now for the biggest show of the hockey calendar – the Super 6s at The SSE Arena, Wembley.